If there is ever a book I wish I had written it is this one. People who have read it as a child light up when you talk about it. Children sparkle when they have read it and are so eagerto tell you about all the brilliant creatures that live in the tree and all the magic lands that come to stay at the top of tree. 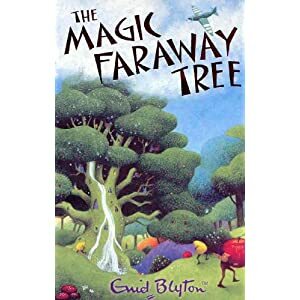 Enid Blyton created a wondeful story setting with this book. The tree has dame wash-a -lot who pours her washing down the tree and soaks the children climbing it. It houses the lovely Moonface with his slippery slip slide right down the middle of the tree. It also houses the Angry Pixie who throws his ink and fairies, gnomes, Mr. Saucepanman and many more delightful characters. It is set in the heart of the Enchanted Wood and is found by 3 children who adventure there. The lands that settle at the top of the tree are wonderful and dream fuelling like the land of birthdays and a bit scary too like the land of the polar bears. The book absolutely enages you and best yet there are 2 more in the series. I read this to my son when he was 5. The perfect age. This is one not to miss and to remember forever. I must have read these books at least a dozen times and I still have copies form my childhood. I love this series, which I’ve just finished reading to my nearly-3-year-old. Okay, so she’s a bit young to appreciate them, but I don’t think you can get too much of them or the similar Wishing Chair books. I loved them all as a kid, and hope she does too as she gets older. Oh yes! My DD who is 10 still reads her copy of this book time and time again. She LOVES Enid Blyton and some of her language shows she is well read in this author – the other day I was wearing a dress and my DD commented “I love your frock”. LOve it! My son said splendid the other day! !